Developed in conjunction with some of the worlds leading perfomance vehicle manufacturers including Aston Martin, Ferrari, BMW and Lamborghini. 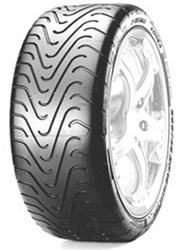 The Pirelli P Zero Corsa system is the most sporty tyre on the market according to Pirelli. The P Zero Left has been designed to be fitted to left hand side of the vehicle, primarily for use on the front axel, these will allow maximum grip and handling, offering some of the most precise traction of any tyre. This special edition of the Ultra High perfomance P Zero Corsa System Left K1 has been designed, manufactured and approved with the help of Ferrari engineers to ensure optimum perfomance when fitted to certain Ferrari vehicles.